Back on Viking Danube we cruised through the Wachau Valley enjoying the scenery (and a warming soup) from the comfort of the Viking lounge. The hills are close to here, it’s a wine producing and apricot growing region with vineyards, churches and monasteries on every bend. A commentary from our program director, Marcela, sitting in the wheelhouse was appreciated, keeping us up to speed with the passing sights. Felt a bit guilty though at the thought of Ian, getting chilly on deck taking the photos. A strudel making demonstration and talk of Viennese coffee this afternoon to prepare us for cafe society in Vienna tomorrow. 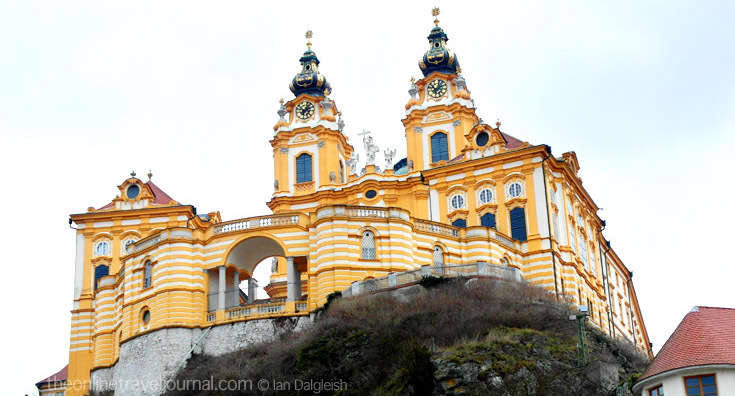 Many of the finest 18th century painters and stucco craftsmen had a hand in creating the splendid interior of Melk Abbey. Leather bound books line the walls of the abbey library - can you make out the hidden door in the bookcase above?